This Sunday night it’s the 27th annual Royal Rumble pay-per-view event taking place in Pittsburgh, Pennsylvania. There are only four matches announced in addition to the actual Rumble match, which usually goes about an hour in length. Since one of those matches will take place on the Kickoff show, that means only three matches on the actual PPV. 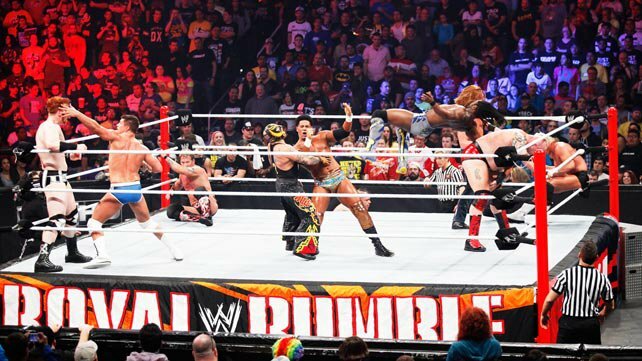 Looking at the Rumble card from last year, it would be similar to what they did then too. Since the three singles matches all look like they could go more than 15 minutes then based on the timing of the matches, plus all the video packages and hype for WWE Network, it’s likely that this is the full card. The rumor is that if they feel like there is time for one more match then it will be AJ Lee defending the Divas Title against Naomi. If that happens I’d expect AJ to retain the Divas Title. She shouldn’t lose it in an unadvertised match. That would be silly. There have been rumors of the Goldust/Cody split leading to a WrestleMania match (with Goldust likely as the heel) ever since they started teaming up. They’ve done a great job as a team, though, so it’s hard to know if that’s still the plan or if it was. The Goldust/Cody rumor was something that Goldust has been talking about on Twitter for a couple of years now. Whether WWE actually does it or not, we don’t know yet. The challengers for this match are a team that’s only wrestled a couple of times this year, yet they’re getting a tag team title shot. The story is that since they bailed as CM Punk’s partners in a tag match, their old buddy HHH gave them a non-title match on Smackdown, which they won (after a Vickie Guerrero promo). They have done a good job in the matches they’ve had. While they’re obviously not as good as they were 15 years ago, they’re still two charismatic guys with good chemistry. I think there will be a tag team title change soon. A heel team will win them, but I don’t think it will be at this show. Drop them to the Real Americans on Raw and then they can drop them to the Usos at WrestleMania. That would be the best way to do it. This is actually a hard match to predict because the Outlaws winning makes sense from a story perspective although I don’t think they’re the right team to win the tag titles. I think it will go 12 minutes, the champs may mess up a couple of times and tease a mistake, but ultimately I expect them to find a way to win. Both of them are in the Rumble match too, so maybe they can tease some tension there. The obvious choice for this match is Daniel Bryan and that’s who I’m going with just because there’s no reason for him to lose to Wyatt. He lost the 1 on 3 handicap match they had, then he joined the group and he got some vengeance when he unleashed an attack on Wyatt a couple of weeks ago on Raw. The thing is, this could just be a part of the story they’re trying to tell without ending it here. There’s the Elimination Chamber PPV that could see both guys as part of the 6 man match in the chamber or they could have another singles match. I also expect a really hot crowd for this match because Bryan’s as popular as ever and when he returned to his old self on Raw it made the fans love him that much more. Bryan’s my pick to win although it’s far from a lock and I think a Wyatt win makes a lot of sense too. 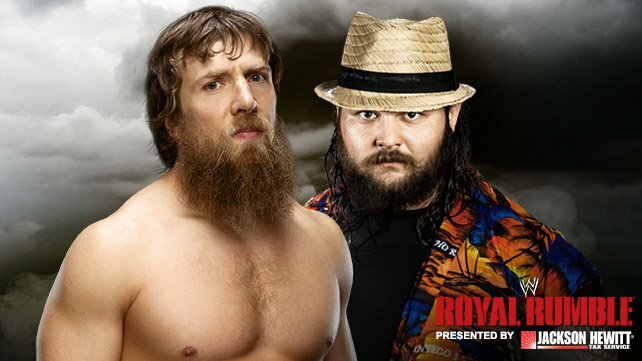 It’s just a shame that both of these guys aren’t advertised for the Rumble match, especially Bryan. When Lesnar signed with WWE two years ago it seemed likely that they would go back to this match because of their past. From the time when Show beat Lesnar for the WWE Title in 2002 to the time when they did the superplex spot where they broke the ring in 2003, they always had good chemistry. Sometimes two bigger guys wrestle and it’s not entertaining, but Lesnar vs. Show is usually pretty solid. What I think will happen is Show will hit Lesnar with everything he can (including the KO Punch) only for Lesnar to keep kicking out. The point of this match is to make Lesnar look like an absolute beast that can take punishment and overcome it to find a way to win. The final visual will likely be a Lesnar F5 on Show, which is always an awesome sight. We haven’t seen it in a very long time, so I expect a huge reaction when it happens. Big Show is just a guy for Lesnar to beat on his way to bigger opponents at Elimination Chamber (assuming Lesnar is wrestling there) and at WrestleMania 30 (possibly Undertaker). Lesnar winning this match is the biggest lock on this show. I think the build up for this match that WWE is trying to label “the biggest championship rematch in history” has been very poor. Since their TLC match for the WWE WHC, which was won by Randy Orton, they really haven’t interacted all that much. The only noteworthy thing that happened in nearly six weeks is that Orton decked Cena’s dad with a cheap shot punch to the head. How did they follow that up? By having John Cena wait THREE FREAKIN’ HOURS on Raw one week later to avenge the pain that his father suffered at the hands of Orton. So we’re supposed to believe that Cena took three hours to get to the building where he was working at? It’s so silly. The booking for this match is going to be interesting too. It’s unlikely that Cena is going to leave as WWE Champion because Orton was put over Cena at TLC and it would hurt Orton too much to drop it so soon after he won it. Even WWE’s booking team is smart enough to know that. Right? Assuming they are smart enough, my question is how does John Cena lose this match? He rarely loses clean. What happened at TLC was a very creative finish, but it’s not like they can be as creative in a regular match with no stipulations. What’s also interesting is that with Elimination Chamber on the horizon on February 23rd, it’s likely that the main event is going to feature a WWE Title match. The champion will likely defend the WWE WHC against five other guys. I would say the chances are high that these two will be involved in that. With that in mind, I can see Orton retaining the title here using some kind of cheap tactic or perhaps the help of somebody else that we don’t expect. My prediction is Orton retains after 20 minutes although I don’t think it will be that clean, so it may be a DQ or Countout win by Orton. Perhaps they end up brawling outside the ring for the double countout? Could happen. I believe Cena will be getting another title shot at some point, so if you’re sick of this rivalry then too bad. It’s likely going to continue. Batista is going to win this match. The 45 year old that hasn’t been in WWE for nearly four years, that won this match nine years ago is going to win this match even though it really should be Daniel Bryan or CM Punk. Why will it be Batista? Because that’s what WWE does. They push the bigger guys with the bigger muscles with the history as a main eventer over the guys that have been doing their best to carry the company for the four years while the other guy was gone. It’s the most frustrating thing about being a WWE fan. It’s the wrong guy at the wrong time. That’s what this is. In WWE’s defense, they can point to this week’s Raw and say “we got our best ratings in 10 months.” That’s their way of being proven right. They spent one month airing promos for Batista, telling the fans he was coming back at Raw and the fans tuned in for it to give them great ratings. Their thinking is that a guy like Bryan didn’t do that great in terms of PPV buys or ratings when Cena was out and he was pushed heavily, so they’re not going to push him as “the man” right now. The other way to think about it is that since WWE knows they will have a bigger audience during this time of year (no NFL competition plus WrestleMania season) they should be more willing to push a guy like Bryan to the top because more people are going to be watching every week. As of right now, Daniel Bryan isn’t even booked for the Royal Rumble match. He hasn’t mentioned it on television. He hasn’t been mentioned as a participant. It would have been nice if he was in the match as a way to give fans hope that he was going to win. By not even advertising him you’re making him look like a loser by not including him in a match like this. In terms of surprises, I think we’ll see Sheamus back. He’ll likely be a heel sooner or later just because the roster is currently loaded with faces. Christian should return here also. Evan Bourne is said to finally be healthy, so he’s a possibility. It would be cool if there was the return of Jake Roberts because he has been tweeting about wanting to do it for many months now. If he can do it then let him. Also Kane’s not listed in the match, but I expect him to be there too since he’s always booked strong in a match like this. There might be other surprises too although I really doubt they will be big names. The good thing about this match is that CM Punk is the first entrant. It’s expected that his WrestleMania 30 opponent will be Triple H, so expect him to be eliminated in some kind of screwjob fashion. Due to the lack of star power in the match I also expect Punk to make it near the very end, which could mean final four or five. He’s certainly a well conditioned athlete and will be fine if he has to go 45 minutes or so. There should be some tension with Roman Reigns, Dean Ambrose and Seth Rollins too. While I don’t expect a full breakup of The Shield yet, it’s likely going to be teased throughout the match. Expect them to work together early, then we could see Ambrose try to eliminate Reigns, fail at that and then Reigns would end up dumping him out. A match like this is the perfect spot to plant the seeds for that trio falling apart. In the end, I think the final two will end up being Batista and Alberto Del Rio with Batista winning the match. It’s not what I want to happen. It’s what I think WWE will do. Hopefully it’s a well booked match with some memorable spots because going into it the whole thing feels really predictable. I realize that two years ago most had Chris Jericho pegged as the winner when it ended up being Sheamus. Both of them ended up getting major title shots at WrestleMania and Jericho’s was the bigger one. The winner didn’t really matter, did it? Things are different now. The winner gets the WWE WHC match. It will be Batista. I think it will be a good show with strong matches in the undercard and the Rumble match has the potential to be really good like usual. My concern is that the the Rumble lacks the unpredictability factor that has helped it in the past. Last year we knew Cena was winning. This year it seems pretty obvious that Batista is winning. A lot of WWE booking has been pretty predictable the last few months, which is a bit disappointing. Ultimately what matters is that the show is entertaining and I think the singles matches on the show are going to be very good, so that will definitely help. I’ll be writing about the Royal Rumble live on Sunday night on TJRWrestling.com (and after the show on this site), so join me for that live on Sunday or check it out after the show is over. From a fan perspective and a writing perspective, it’s my favorite show to write about. It’s never easy to write about it either, but I’ve gotten used to it over the years. I plan on enjoying the show. I hope you do too. Do me a favor and check out my writing on WhatCulture.com also. My favorite post went up a couple of days ago and it’s about my perfect WrestleMania 30 card. It’s all WWE stuff that’s exclusive to them. I write multiple times per day with more on the way every day, so check it out.